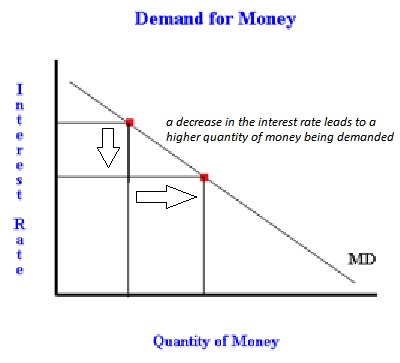 The money market, open market policy (purchases and sales), in the context of monetary policy - FreeEconHelp.com, Learning Economics... Solved! Actions the Federal Reserve takes to control the money supply and interest rates in pursuit of macroeconomic policies. variables directly. It uses the money supply to indirectly affect unemployment and inflation. There is also usually a tradeoff between unemployment and inflation when changing the money supply. For example, during an expansion of the money supply, there is more money in the economy so more goods can be purchased and unemployment tends to fall. However, with more money in the economy inflation tends to rise. Likewise, by contracting the money supply, unemployment tends to rise and inflation tends to fall, so the Federal Reserve has to put a lot of thought into their actions in the economy. We can better understand these relationships by considering the demand for money within an economy. 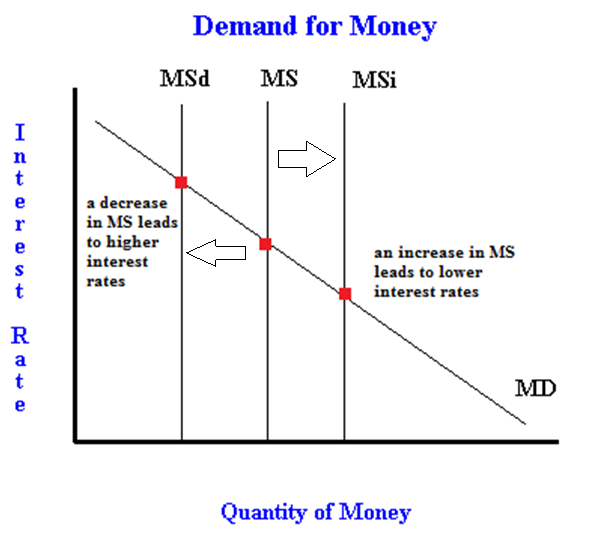 You can see that the money demand (MD) line is downward sloping, which means that a decrease in the interest rates will lead to an increased amount of money that is demanded. Likewise, an increase in the interest rates will lead to a lower amount of money that is demanded. The intuition behind this can be found in your own personal saving strategy. The amount of money you keep in your wallet or your checking account (which earns little to no interest) is a lot less than the amount of money you keep in a savings account, CD’s, bonds or stocks. When the return to these accounts are high (high interest rates), you are less likely to keep money lying around. However, when these accounts earn little interest (0 to 1% like now) then there is no real opportunity cost to keeping all of your money in your wallet or checking account, so the quantity of money that you demand (hold in your wallet or checking account) is high. 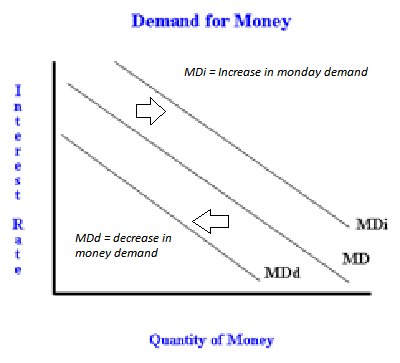 The two most common circumstances that will cause the demand for money line to shift are changes in GDP and the price level. Note that changes in the interest rate are already accounted for in the model (because they are on the Y axis). An increase in GDP means that there are more goods and services in the economy that can be purchased. This will cause the MD line to shift right or increase because people need more money to function in this economy with more stuff. Also, if the price level rises, then everything else equal, people will need more money to function in this economy with higher prices and we will see the MD line shift right or increase. On the opposite side, a reduction in GDP means that there are less goods and services in the economy so less money is needed. This will cause the MD line to shift left, or decrease the amount of money that is demanded in the economy. Also, if price levels fall, people will need less money to complete their necessary transactions so we will see the MD line shift left or decrease. 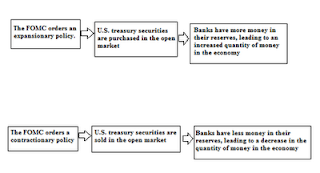 The Federal Reserve controls the money supply buy purchasing and selling U.S. treasury securities. When the Federal Open Market Committee (FOMC) decides to increase the money supply, they do so by buying these treasury securities from banks. They give the banks money in exchange for the securities. This increases the amount of money that banks have, which increases their money reserves which they can then lend out to people who want to borrow money. 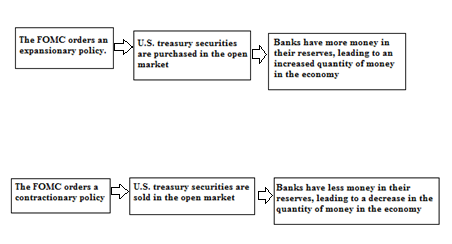 Likewise, when the FOMC sells U.S. treasury securities, they receive money from the banks. This means that banks have less money to loan out to those who want to borrow, which lowers the supply of money available in the economy. 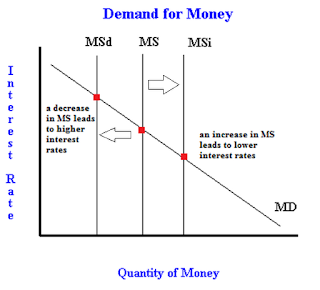 You can see in the graph above that an increase in the money supply shifts the MS curve to the right to MSi. This results in a reduction of the interest rate because of the downward sloping nature of the demand curve. 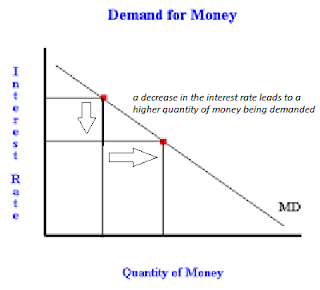 Likewise, if the Federal Reserve decides to decrease the money supply, we will see interest rates rise, because of the upward sloping nature of the money demand curve. You may remember that we have two models that help us determine what the interest rate will be in an economy. 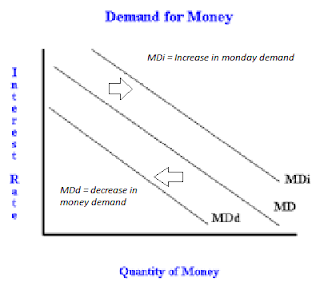 What happens, for example, if the interest rate in the loanable funds market decreases, but we see no change in this demand and supply for money model? The truth is that the money model determines short term interest rates, and the loanable funds market determines long term interest rates. It is generally true that fluctuations in the short term interest rate will have longer term effects that then show up in the loanable funds market. The Federal funds rate is the interest rate that banks charge each other for overnight loans. This is important because banks have to keep 10 percent of their checking account deposits as either currency on hand, or through deposits with the Federal Reserve. In order to make sure they meet this requirement every day, they sometimes have to borrow money in the very short term (daily). The Federal Reserve does not directly set the Federal Funds rate, but can influence it indirectly by supplying more or less money through their open market operations.